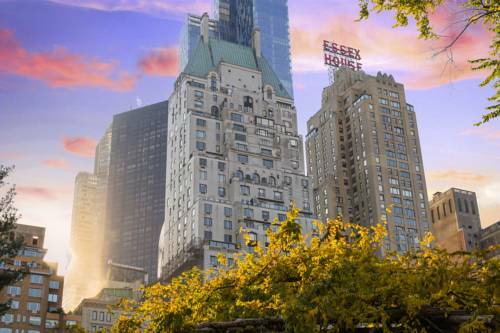 A work of art among Central Park hotels, JW Marriott Essex House New York has served as an icon in New York skyline since 1931. Our hotel is near Central Park in NYC and ideally located in the heart of it all, with Lincoln Center, Carnegie Hall, Columbus Circle, the Theater District and 5th Avenue all within reach. The ornate gilded doors and rich wood paneling throughout our NYC hotel harken its Art Deco history, while cutting-edge technology seamlessly blends the past and present. Unwind in our guest rooms where Internet TV allows you to stream your favorite shows, movies and music. Enjoy breathtaking views of Central Park and Manhattan from our spacious hotel suites. Dine at SOUTHGATE Bar & Restaurant featuring hearty meals and small bites with specialty cocktails. Whether visiting for a decadent NYC wedding or business meeting, our Beaux Arts Grand Salon is the perfect space to gather. No matter what brings you to town, start planning your New York, New York stay and book today! SOUTHGATE, our restaurant near Central Park, features an American menu that focuses on locally sourced ingredients, complemented by a generous selection of libations. Join us all day, or for a nightcap, with light fare available until 1am.